So, I have now been living in the Alps for about 4 years. And I cannot claim that it was easy at first. I grew up in South Africa where my garden list was over 200. I then lived in Central America where there were more bird species than my bird books (and my competence) could hope to identify. The Tirolean Alps are – well – rather barren by comparison. But then again, those are some pretty hard acts to follow. All these images were taken right here, where we live and make fancy schmancy binoculars. In fact, the photographer, Christoph Malin (who normally spends his time doing/photographing craziness on mountain bikes) lives in the same village as our factory. So it is not just that the images are beautiful, it is also that they were taken right here! so, the thing is, when I first got to Tirol, I really needed a bit more of a push to get me outside and birding. To see what I could see. To explore the (relatively) depressing forests. And out of that, came my Discovering Alpine Birds blog. I added the “discovering” bit, because while I could find a Mealy’s Parrot nest with relative ease and felt at home in a good few bird communities, I had absolutely no idea about European birds. And with no-one about to teach me, I was left to my own defences to find and get to know the 3 species that regularly occur here. Which brings me to another- mostly unrelated point – I really believe that a whole pile about being a good birder is pure innate talent. I have always loved sport and have always played a lot of sport. And lots of different types of sport too. And I am a bit of a Jack of all Trades in that I am competent at lots of sports, but I just simply lack the natural talent to be really good at anything. Let’s face it, I will never ever be able to show Sachin Tendulkar or Andre Agassi anything (besides maybe the way to the toilet). Unfortunately, I have recently realised that my ability as a birder falls slap bang next to my sporting ability. And this realisation was hard. really hard. Because, let’s face it, the average European birder – especially those that are more competent – are a rather critical bunch. Just look at this Birdforum thread and you will know what I mean. But now I seem to have wondered completely off of what I was trying to say. What I really wanted to express is that so much of the joy I get out of birding has very little to do with what I am seeing, or where I am, but more of a deeper, unexplainable appreciation. Sure I get more excited about a Banded Pitta than a European Robin. 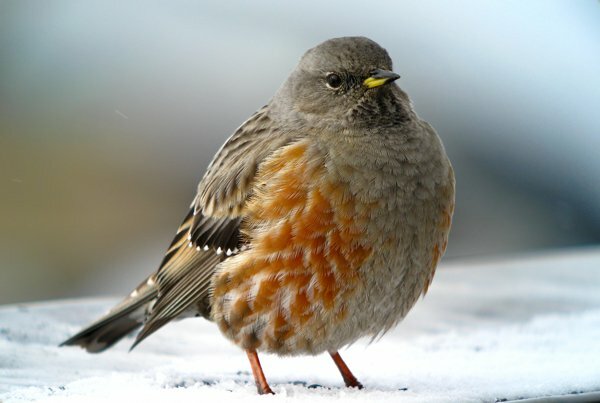 But I also really like robins. And stars. And mountains. Damn, I think I am going to get called a robin stroker. The Alps. They are really about quality not quantity (not suggesting there is no quality in a SA garden list of 200+, but … you know what I mean), and a continued appreciation of the little wonders along the paths one wanders. But wandering in the Alps, as I am wont to do on occasion, I can’t help but wonder if the wonders along the paths I wander would still get me excited if they were all I saw for many years. Sure, Bearded Vultures will ALWAYS take my breath away, but a quality-rich yet quantity-poor environment generally? @Jochen, you raise some good points. Bearded Vultures are known to take one’s breath away. As I tried to express in my rambling post, these are some of the questions that are running through me at the moment, and they are linked to so many things in my life – all bound together by a thread of appreciation. I recently watched a TED talk about the paradox of choice (http://youtu.be/VO6XEQIsCoM). Where I am at the moment is that one can find joy and appreciation and excitement in anything; if one allows it. there is no such thing as bad weather. or bad birding. @Dale: true, so true. I think it is important to get out once in a while, like your occasional trips to SA. If you get stuck in one area for too long without a break, it gets difficult to keep on appreciating. That’s my experience, and it held true in boring areas like Heidelberg as well as in exciting areas like southern Namibia. And yeah, that video. Not bad, ey? I mean, not entirely bad, right? You know, like, as close to mind-blowing and cardiac-arresting as videos tend to get, okay!? Geez, Dale, thanks so much for sharing! This really needs much wider distribution! Gadwall Ducklings, or, Aaawww, Cute!